To keep an eye on the health of your network and diagnose problems that crop up, an essential activity is network traffic monitoring: monitoring and analyzing your traffic to know your network performance and which traffic is consuming your bandwidth. SolarWinds Real-Time Bandwidth Monitor (FREE DOWNLOAD) – A free bundle of tools that uses NetFlow, J-Flow, and sFlow to record traffic patterns and capture packets. Paessler PRTG Network Monitor (FREE TRIAL) – The PRTG tool contains a large number of sensors, among which are NetFlow and sFlow monitors. SoftPerfect NetWorx – Free for 30 days, this tool for Windows, Mac OS, and Linux would be perfect for monitoring small networks. ManageEngine Bandwidth Monitor – Part of a suite of infrastructure monitoring tools, this utility uses NetFlow messaging to examine network traffic. ntopng – With a free community edition, this open source network monitor uses nProbe to gather traffic flow information. WhatsUp Gold – A network monitoring tool that installs on Windows and can be extended by a specialized Network Traffic Analysis module. 1 Why monitor internet bandwidth? 2 Why use a network traffic monitor tool? If you run a WAN with a lot of interaction between sites, if you integrate Cloud services into your IT infrastructure, or if your main business outlet is your website, your bandwidth monitoring needs to cover internet performance as well as network bandwidth utilization. You no doubt have a service plan with an internet provider in order to connect your business together across the world and to communicate with suppliers and customers. You may have chosen a plan that does not provide you enough bandwidth. You will only discover that situation when you monitor bandwidth consumption on your internet connections. Why use a network traffic monitor tool? Your ISP promises to provide you with a reliable pipe to the Internet of a certain volume; your chosen network hardware install is designed to provide a particular level of service within your facility. Are you getting your expected bandwidth and availability, or is something failing to deliver? Is unexpected traffic consuming the bandwidth that you are getting? Tools that monitor network traffic and bandwidth can leverage various technologies. A host can observe all the packets passing by a particular network interface (that is, packet capture). Most managed network devices – and hosts – support SNMP, and so they can be queried to get performance statistics. Bandwidth monitoring focuses on the available capacity of network equipment and the amount of that capacity that is occupied by traffic. You can extend that visibility further by getting a breakdown of traffic volumes by application or by source and destination to spot where the real bandwidth hoggers are. You need to watch the bandwidth consumption of each link in your network, not just the overall bandwidth availability. One link can get congested, while others retain spare capacity. Adding on extra bandwidth to alleviate overloading on one link can cause extra throughput to get through and overload other links. That congested link may be hiding the underprovision of bandwidth in other areas of the network. If your network devices support a traffic monitoring protocol like NetFlow or sFlow, they can publish traffic data to your monitoring tool. For more on these technologies, see Intro to traffic analysis in The best free NetFlow analyzers and collectors for Windows, and NetFlow vs sFlow: What’s the difference and which is better? 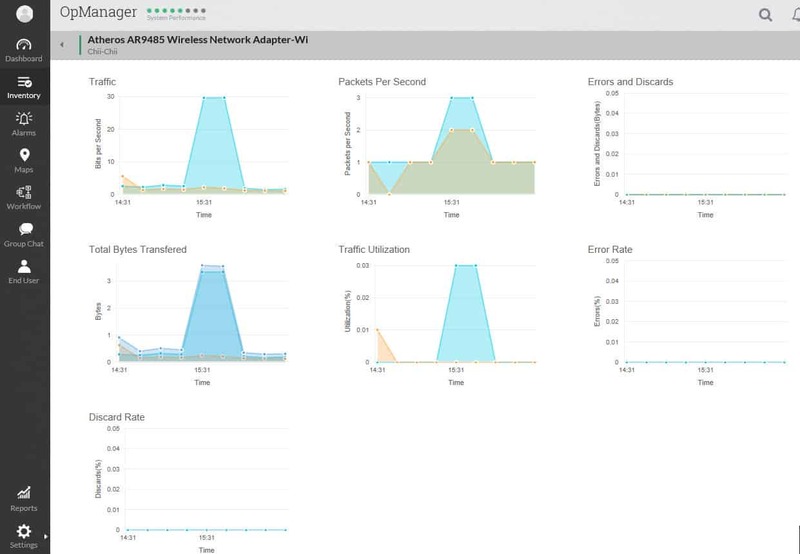 Which network bandwidth monitoring tools are right for you? There are several considerations when performing a network monitoring tools comparison. One factor is what monitoring technologies your installed hardware supports (eg, do they support SNMP? NetFlow? sFlow?). One is the size and complexity of your network; a simple tool that’s a great fit for a small office is completely inadequate for a large sophisticated network. 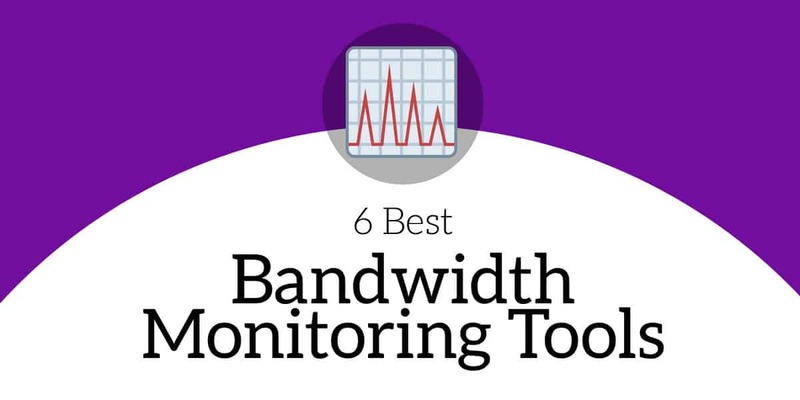 Here we’ll look at the most popular and feature-rich free bandwidth monitoring tools that can give you real-time data on your network and internet bandwidth utilization. Monitoring tools that enable you to perform a network bandwidth test on demand provide analytical functions. Troubleshooting bandwidth problems is impossible without the ability to collect and store network traffic. You need a tool that can monitor your network for you while you are busy with other tasks. In order to get that level of service from your bandwidth monitor, make sure you choose a tool that is able to check for traffic levels approaching your full bandwidth availability and send you alerts. Reports that can be scheduled at all hours of the day will also help you keep watch on your bandwidth utilization 24/7. Analytical features in tools help you plan your capacity requirements both to meet current demand, to account for trend traffic increases, and to provision for extra services when demanded. If your chosen bandwidth tool can save collected traffic to a file, open files, and traffic data into a viewer, then you can begin to observer traffic patterns over time. Viewers that include filtering, sorting, and tagging capabilities will allow you to identify the sources of bandwidth capacity problems. Analytical tools that have sophisticated graphical representations for data and comprehensive reporting formats will enable you to communicate problems and solutions to stakeholders in your organization and arrive at collaborative decisions. We have taken all of the above requirements into account and compiled recommendations on the software that you should consider when you are in the market for a bandwidth monitor. There are many great monitors available at the moment, but you won’t have enough time to check all of them out. So, we wrote this guide in order to cut down the time you have to spend investigating new software for your enterprise. SolarWinds makes a suite of products providing comprehensive support for network monitoring and management. Their Real-Time NetFlow Traffic Analyzer provides useful data about bandwidth for devices that support NetFlow; we discussed this tool in an earlier post on the best free NetFlow analyzers and collectors. Here we’ll focus on another free tool from SolarWinds, the Real-Time Bandwidth Monitor. 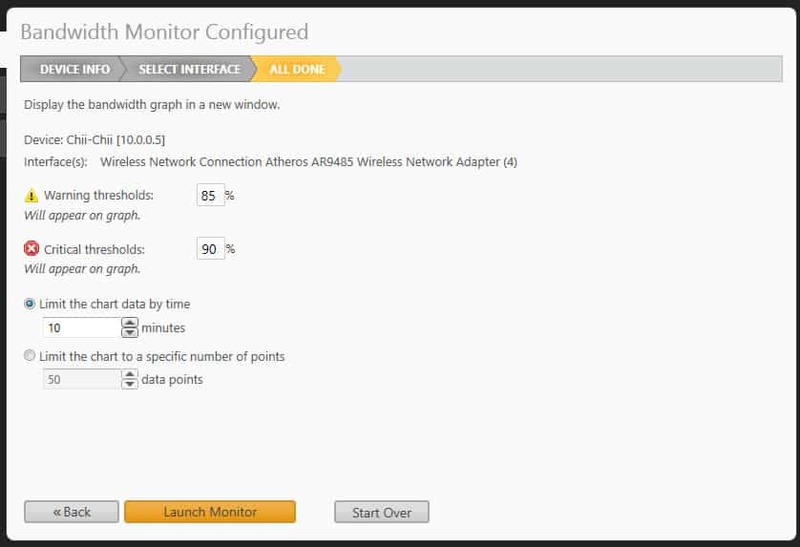 The SolarWinds Real-Time Bandwidth Monitor runs on Windows. 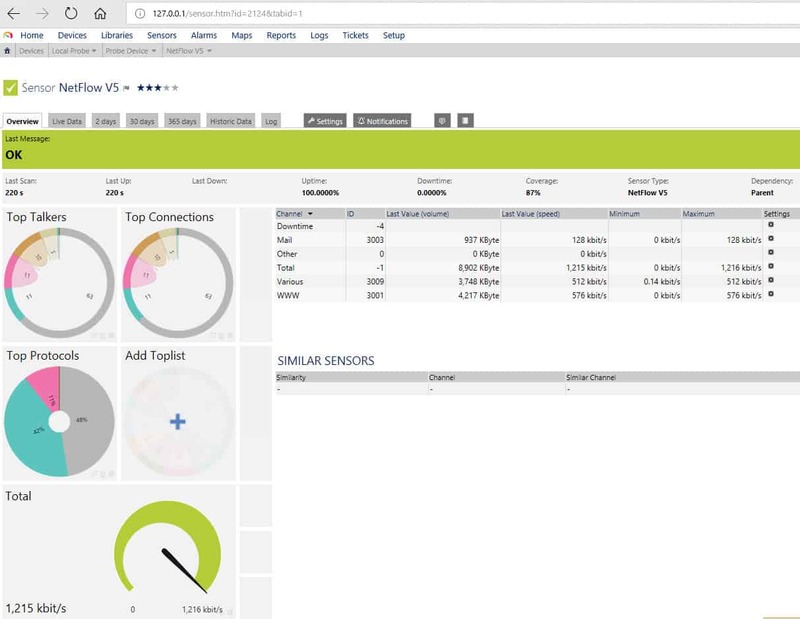 It uses SNMP to poll multiple network interfaces in real time for their traffic statistics, and visually displays the status of a chosen interface graphically. Once you’ve provided the IP address and SNMP parameters for the device or host, the Real-Time Bandwidth Monitor lists the interfaces there and basic data about them. Selecting one of the interfaces provides you with a graphical display of bandwidth usage on that interface. You can set per-interface thresholds so that the graph displays an alert when usage exceeds your chosen limits. The Real-Time Bandwidth Monitor is a great way to see what’s going on at particular interfaces, particularly for devices that do not support NetFlow (or sFlow). The SolarWinds Real-Time Netflow Traffic Analyzer can roll up traffic by conversation, application, domain, endpoint, and protocol; the Bandwidth Monitor works from more basic metrics, so it can’t do that. But when you have devices that don’t support the traffic flow monitoring protocols, the Real-Time Bandwidth Monitor an essential tool. TWO FREE TOOLS: Get both free tools from SolarWinds in the Bandwidth Monitoring Bundle. You can also get both those free tools from SolarWinds in the Bandwidth Monitoring Bundle. 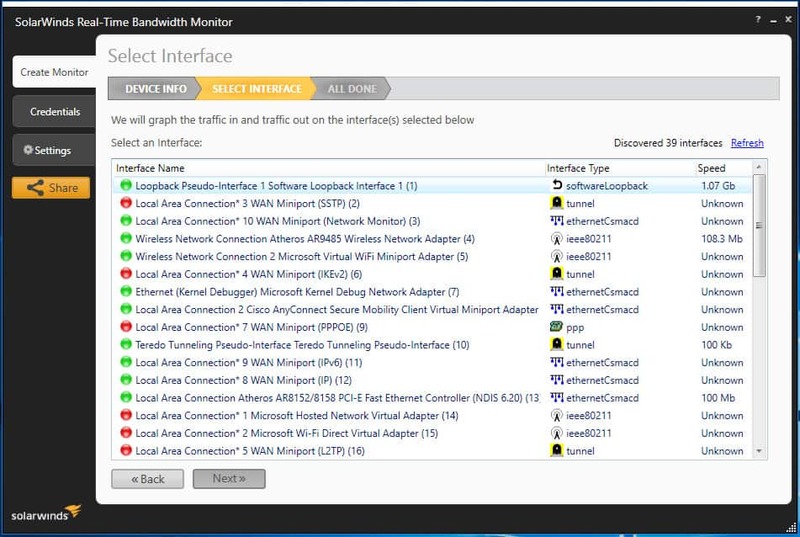 Another option for bandwidth monitoring that is offered by SolarWinds is the ipMonitor. This is not a free tool, but you can try it on a 14-day free trial. This is a specialist tool that monitors networks, servers, and applications. It keeps you aware of all performance metrics, including uptime availability, internet service quality, and network capacity. This monitor works on real-time data, includes alerts and reporting functions, and it will help you head off capacity-related system failure. 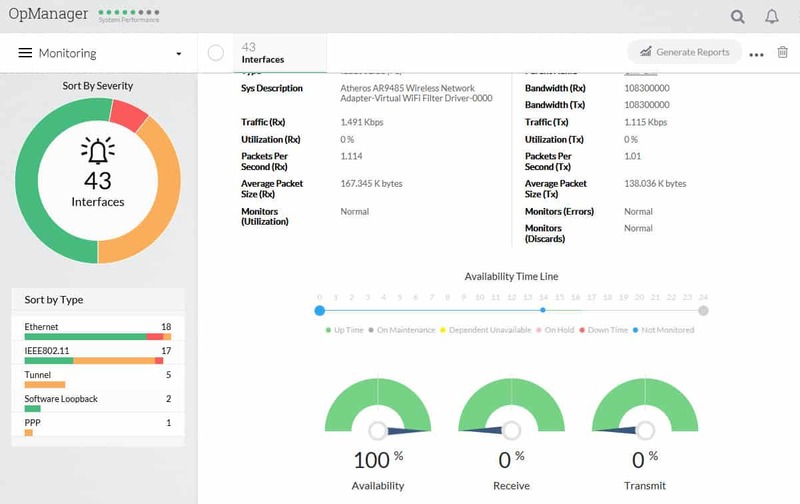 If you decide to move up to a for-cost tool that can grow with your business up to enterprise scope, Network Bandwidth Analyzer Pack includes Network Performance Monitor and NetFlow Traffic Analyzer; for more on those tools see SolarWinds NetFlow Traffic Analyzer review. 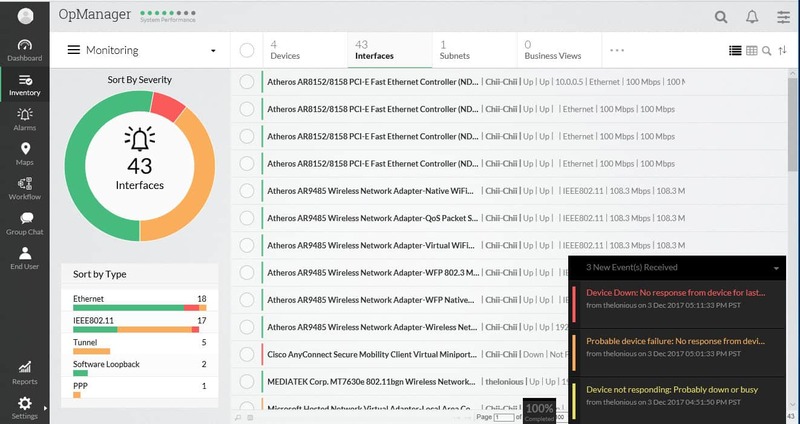 A powerful tool which not only monitors and graphs multiple network interfaces in real time but you can also set up per-interface thresholds and alerts, particularly for devices that don’t support NetFlow. Bundled with a free network analyser, you can see traffic by conversation, app, domain and endpoint. It’s also 100% free. The Paessler PRTG Network Monitor is a “batteries included” solution that monitors bandwidth utilization, the health of devices on your network, and more. The free version is limited to 100 sensors after the first month; since a sensor is an individual data stream, each device will typically require several sensors. The PRTG Network Monitor runs on Windows. It uses SNMP, WMI, NetFlow, sFlow, and packet sniffing. Setting up the tool is a bit complex but a setup wizard and how-to video are provided. The free version of PRTG Network Monitor provides a well-stocked toolbox for monitoring a small network, download the free trial here. For more details, see The best free NetFlow analyzers and collectors for Windows. 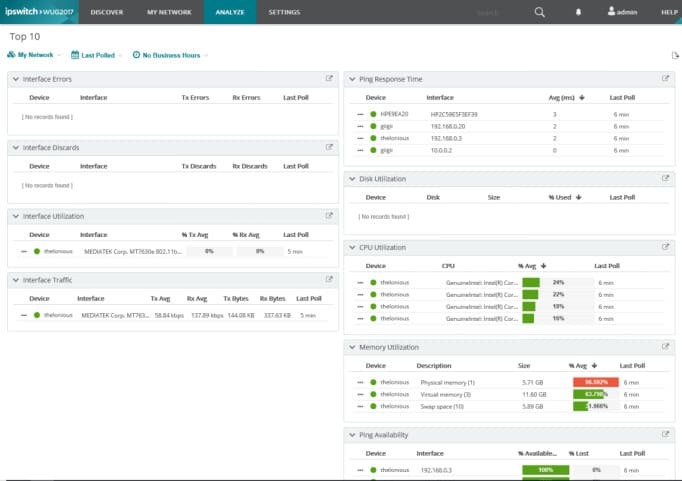 Many network monitoring toolsuites assume you’re administering a large and complex network, and so provide a sophisticated array of capabilities. But in the category of bandwidth monitoring, there are many tools that go in the other direction, monitoring the bandwidth of a single PC. That’s likely too minimalistic for you, but if you have a small office, and only need to monitor one (or a few) PCs and a single router, then SoftPerfect NetWorx may be the straightforward tool you need. NetWorx is a clean tool that will monitor the bandwidth usage on one or more PCs, or a single Mac or Linux machine; and it can also monitor bandwidth on your router to the Internet via SNMP. NetWorx is now a licensed tool, so it’s only free for 30 days, after which you must spring for a (fairly cheap) license. 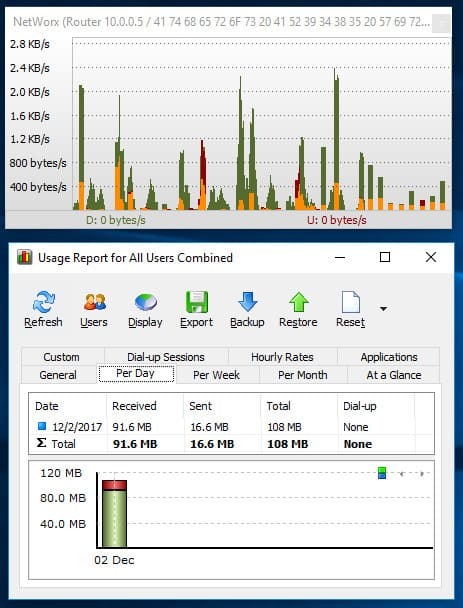 Besides graphing bandwidth, NetWorx provides several tools like a speed meter and a per-user usage report. ManageEngine produces a full network management suite and offers free versions of some of their tools. In our article on the best free NetFlow analyzers and collectors for Windows we looked at the ManageEngine NetFlow Analyzer which provides real-time visibility into network bandwidth and traffic patterns, when you have devices that support NetFlow. 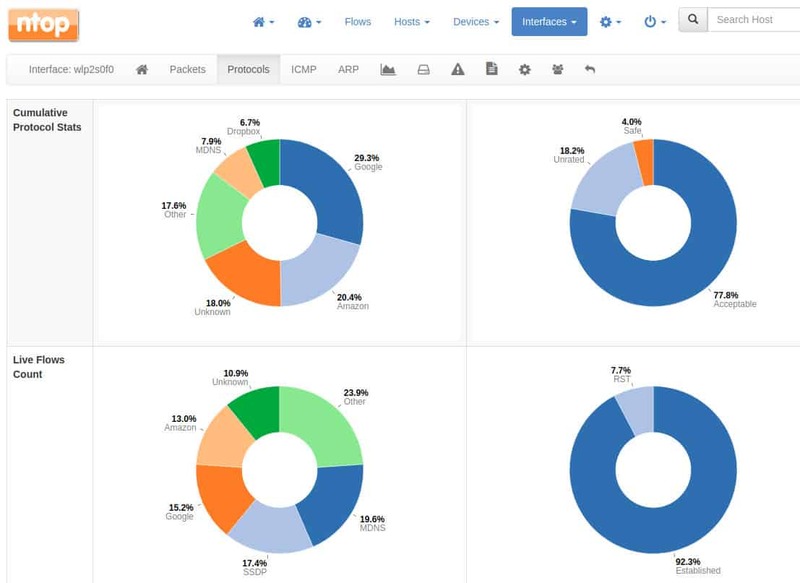 The NetFlow Analyzer displays traffic by applications, conversations, protocols, etc; it can alert you to problems, and has a range of report-generation options. Here we will focus on the Bandwidth Monitoring tool that is part of the free edition of ManageEngine OpManager. The Bandwidth Monitoring tool leverages SNMP. It runs on Windows or Linux. The free edition support monitoring 10 devices and their interfaces. Setting up the OpManager is a multi-step process but not overly complex. 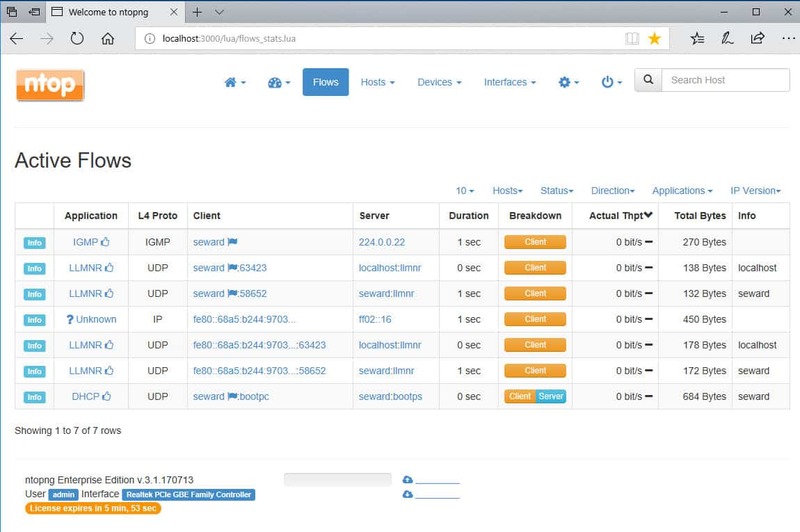 Once you provide the subnet and SNMP parameters, OpManager will scan your subnets and discover your devices. Then, from the inventory tab you can check the status of devices’ interfaces. You can view graphs and tables of network speed and bandwidth, as well as device hardware metrics, either rolled up at the device level or drilling down to a particular interface. At the interface level you can generate reports showing bandwidth from the past 12 hours up to the past month. You can also set thresholds to receive automated alert email or SMS messages. By monitoring the gateway to your ISP, you can check your internet usage and how much bandwidth you actually receive. The Bandwidth Monitoring tool, combined with the other features of the free version of ManageEngine OpManager, provides you with a well-rounded suite of capabilities for monitoring 10 or fewer devices on a small network. ntopng is an open-source web-based traffic analysis tool. The community version of ntopng is free; the professional (small business) and enterprise versions require buying a license. All versions do packet capture; the enterprise version also uses SNMP. To receive flow data ntopng depends on nProbe; a fully-functioning version of nProbe requires a paid license. Licenses are free to educational and nonprofit organizations. ntopng’s web-based user interface rolls up data into traffic (eg, top talkers), flows, hosts, devices, and interfaces. ntopng is a richly-featured open source traffic and bandwidth monitoring tool. WhatsUp Gold is a well-known network monitoring tool from IPSwitch that’s feature-rich yet straightforward. It’s available in both a free starter edition and a 30-day trial to evaluate the paid one. WhatsUp monitors network traffic, servers, virtual servers, cloud services, and applications. The free version is a free five-point license for monitoring up to five resources (eg, five servers). WhatsUp must be installed on Windows. Setup is simple and uses auto-discovery. The user interface provides multiple views with an interactive network map and the ability to drill down to investigate issues. WhatsUp Gold list view lists discovered devices. Traffic analysis facilities work with a wide range of flow-enabled devices, including NetFlow, sFlow, NetFlow-Lite, IPFIX and J-Flow. WhatsUp Gold’s traffic analysis dashboard shows traffic status. Dashboards are customizable. WhatsUp provides many canned reports, including reports for bandwidth and utilization; you can design customized reports, too. 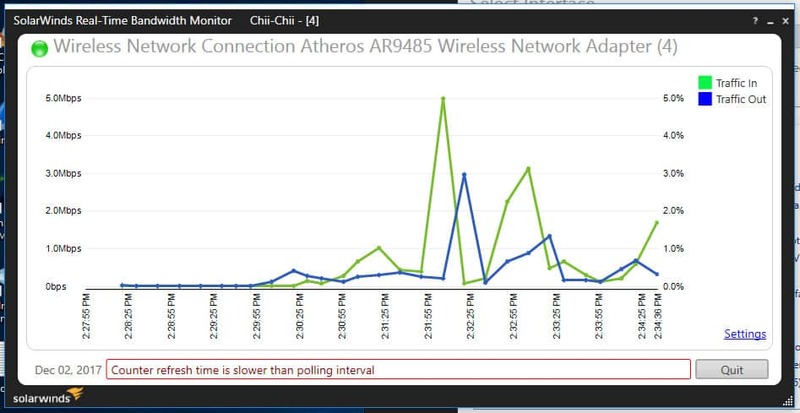 You can configure alerts to notify you when senders or receivers exceed bandwidth thresholds when interfaces exceed utilization thresholds, etc. There are multiple possible methods for notification, including email and SMS. Triggered actions give the ability to execute actions automatically as responses to alerts. The free edition of WhatsUp Gold is a straightforward and fully featured tool for monitoring and managing a small shop. Graduating to the for-cost version lets you move up to covering large networks. Several good free options are available to monitor the bandwidth of your network. Picking the appropriate one will depend on your installed network hardware, the size and sophistication of your network, and how you expect it to grow.